Allison Durham had no issues with her well, until the cannabis grow moved in next door. Even during the drought the well gave no problems, but that was before the cultivation site, she said. Durham was one of about 15 people who attended the first of two Wednesday scoping meetings for an environmental impact report being written for the county’s new marijuana grow ordinance. The environmental report, a key element of the ordinance, triggered the public meetings, as well as a comment period that lasts until 5 p.m. Sept. 10. 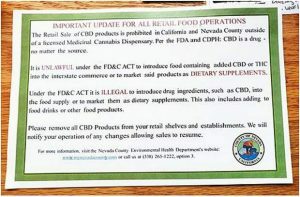 “I’ve only gotten a handful, but I have received some,” said Brian Foss, director of the county’s Planning Department, about the written comments. The environmental report and draft ordinance are expected to reach the county’s Planning Commission and Board of Supervisors by March for approval. Before that occurs, Kimley-Horn and Associates Inc. — the company hired to write the report — will compile the public’s questions and provide answers. Many questions and comments at the first Wednesday meeting focused on water. Mark Johnson asked how Kimley-Horn would determine the source of any contaminants found in the water. 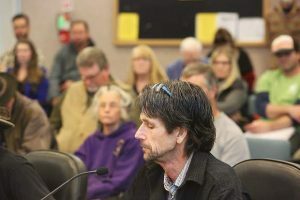 Jonathan Collier, a member of the Nevada County Cannabis Alliance’s executive board, asked if the report will account for the water used by different-sized grows. According to Collier, some farmers growing more plants use less water — a possibility because of smaller plants. Alex Jewell, project manager with Kimley-Horn, said the report likely would use canopy size when studying water use. “We’re looking at that right now,” Jewell said. Lee French, a former member of the county’s community advisory group — a citizen panel that developed recommendations for the grow ordinance — expressed concern over Durham’s well problem. He asked how she could remedy the issue. Foss said the county doesn’t regulate groundwater, adding it’s difficult to tell the source of such water. Shifting to energy, Johnson questioned if the report will detail its consumption. He asked if Kimley-Horn will determine the number of indoor growers. “We’re going to have to make some assumptions at some point,” Jewell said. “Assumptions don’t work,” Johnson replied.